MANILA, Philippine – Soldiers in the northern part of the Philippines received on Monday, June 6, a framed replica of a 280-year-old map often used to debunk China’s claims over the West Philippine Sea (South China Sea). 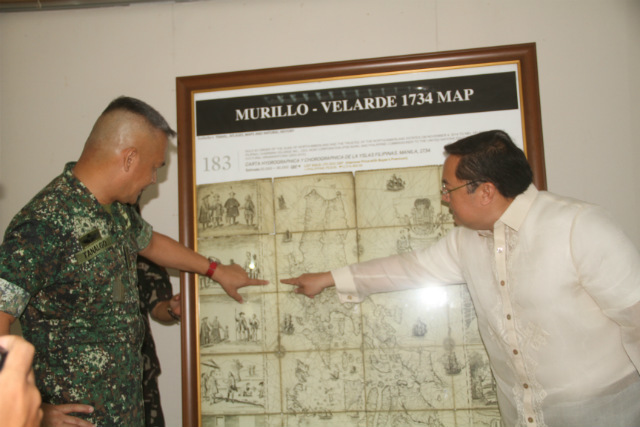 The replica of the 1734 Murillo Map of the Philippines was donated by businessman Mel Velarde, president of Now Corporation and chairperson of the Asian Institute of Journalism and Communication. Velarde gave the replica to the Northern Luzon Command (Nolcom) of the Armed Forces of the Philippines. The 1734 Murillo Map shows that the disputed Panatag Shoal (Scarborough Shoal), also known as Bajo de Masinloc, has been part of the Philippines from as far back as nearly 3 centuries ago. A standoff between the Philippines and China in Panatag Shoal in April 2012 prompted Manila to file a historic case against Beijing. The map was drawn by a Spanish Jesuit priest, Father Pedro Murillo Velarde. Published in Manila, it is the first “internationally recognized scientific map of the Philippines,” Nolcom said in a statement. Nolcom commander Lieutenant General Romeo Tanalgo, for his part, praised Velarde for donating a replica of the map to them. In his lectures, Senior Associate Justice Antonio Carpio of the Philippine Supreme Court has used ancient maps to debunk China’s claim over the West Philippine Sea.